Happy Halloween: Smiley’s Dog Costumes! Our first event came up unexpectedly, the Bridge and Tunnel Brewery was just a five minute walk from our apartment but we had no costume! I quickly cut out an avocado out of Dollar Tree cardboard paper and it was a success! Smiley won some toys and we got a growler for our fun last-minute costume. You may have noticed the dog pictures on my Instagram, or read the two posts I wrote about our rescue Smiley – you may have even read the viral Dodo article about his rescue story! Our unexpected adoption (it only took two weeks of fostering to realize that Smiley belonged with us forever) changed all our plans. All those crazy Halloween parties we wanted to go to turned into us going to dog-friendly pub events, the dog parade and tonight we’ll be going to the big NYC Halloween Parade with Smiley in tow. We ended up going to another last minute event, the Tompkins Square dog parade, so Smiley wore his same avocadog costume and got outshined by popes and other crazy intricate creative costumes! It was a lot of fun and we’re definitely going again next year with a better costume. Although most dogs wore hot dogs, delivery costumes and they rocked them, as a crafter I got inspired to do something a little more creative! Tonight, the parade is mainly for people but Smiley will hopefully steal the show – as long as he actually wears the costume I made him and it doesn’t fall apart. Stay tuned for photos of tonights shenanigans. Author olenakaguiPosted on October 31, 2018 Categories Animals and Pets, New YorkTags Avocadog, Halloween, Halloween parade, Halloween party, New York, Smiley, TompkinsLeave a comment on Happy Halloween: Smiley’s Dog Costumes! Two days ago we sent a $300 adoption fee to Pound Hounds Res-Q, the place that pulled Smiley from Brooklyn’s high kill shelter, NYACC. We had originally planned on fostering Smiley, the cute 6 year old pit mix who was abandoned because his former owners got pregnant. We were in no position to get a dog – we don’t make enough money and live in a small apartment, but we couldn’t let Smiley die. We ended up adopting Smiley after just two weeks of fostering, mostly because we fell in love with our foster boy and also because of Pound Hounds Res-Q. In addition to the fee, we also gave a small donation because of everything the rescue has done for us. Donating to rescues helps them save more dogs so I encourage everyone to do the same! The amazing thing about fostering, is that it’s practically free and saves lives! Shelters such as the NYACC become overcrowded and put animals on the kill list very quickly. They barely get a chance to get adopted! If you foster a dog, a rescue will cover the vet bills and any necessary training. Then you help the dog get decompressed, preferably crate trained and then you help them find a new forever home. Fostering is a great way to help animals without making a lifetime commitment, that many people can’t do. If we hadn’t ended up adopting Smiley, we would have likely kept fostering, because it has been so rewarding. Let me tell you a bit about it! Smiley went from the NYACC to the vet to get neutered, then a special service was hired to bring him to us. We had never met him or even see him in real life! Smiley was friendly and curious but he wouldn’t look up at me or make eye contact. He also didn’t respond to commands, although we were told that he knew to sit, stay and come. When I brought him inside, he explored the place, sniffing every corner and demanding to know what was behind every door. It took over an hour to get him to slow down and rest on his doggy bed. He lay there for a while until I tried to put his harness on for a walk. He wouldn’t let me put it on I’m and bared his teeth, so I backed off and let him sleep. A few hours later, after my husband came home, he let us put the harness on without any fuss. On his first walk with us, he pulled like crazy, giving us rope burn. He was so strong and wouldn’t listen at all outside. We immediately ordered a front pulling harness, but got dragged around painfully for three whole days. We also watched some videos on how to get a dogs attention on walks and we tried to implement them, which only half worked. The first evening while we watched TV, we saw him watching us from his bed. It was the first time he looked at us. Not surprising after being handed off from one person to another for ten days. He was scared and confused. We crated him that first night as instructed by the rescue. People want to adopt crate trained dogs and we had to try our best although we didn’t like the idea of him being in a small cage. He barked a bit but quickly went to sleep. The next morning he woke up wagging his tail at us, it was progress! The second day he acted like a spoiled child, pushing his boundaries. He would jump on the sofa, demand treats and he pulled me even harder outside. I may have had one or two breakdowns that day because I couldn’t connect with him. I couldn’t see anyone adopting a dog that was this crazy and I also didn’t know how long I could spend with him, but I didn’t want to disappoint him like humans have in the past. That night he barked more in his crate at night, and I was stressed knowing that we would have to leave him alone for up to six hours the next day. Everyone reassured me that he would be okay, as long as he wore a cone – he was recently neutered and could rip his stitches. When we came home after our trip, that we couldn’t cancel although we had wanted to, we found his cone out of shape and he was practically hanging by it because a piece got stuck in his crate. It was around his neck so tight that he coughed when I cut it off. He seemed fine otherwise and extra friendly, but I was traumatized by the experience. I was too scared of putting him back in the crate while he had his cone, so we let him sleep in our bedroom on his bed. When he woke up that Sunday (we had gotten him in the afternoon on Thursday) he was a completely different dog. He was so calm at home, looked at us, asked us for pats and actually listened when we gave him commands. That day we took him to a beer festival because we didn’t want to leave him home alone. We had been told that he shouldn’t be around other dogs or kids so we were extra careful. But he was calm around kids, accepting treats gently and he wagged his tail when he saw other dogs. We let him sniff a few and it seemed fine, we were starting to doubt everything that the kill shelter had said about him. We found a quiet spot at the chaotic festival and he sat with us, observing. People came over to meet him and he was so friendly and loving to everyone. No one believed that we had just rescued him. The next day we had received a front clipping harness and the moment we put it on him, he stopped pulling on walks. He still got distracted outside but he was so much better at walking calmly. We let him sniff more dogs and discovered that he was super friendly but couldn’t tell between dogs that wanted to play or fight. The following week he started to feel at home. We let him sit with us on the couch but still kept him out of bed. He behaved better every day. Except the one time he jumped on the bed when I screamed because I saw a spider – but that’s because I screamed and I assume that he was trying to protect me. During the week we also let him play with some dogs while leashed. He seemed to get along with everyone, ignoring the dogs who were aggressive and he backed away when an angry cat jumped out at him. He was clearly a good gentle boy! That second weekend we had him, we took him to an amazing day care Petbuddy Services for a trial day. We were nervous to see how he would get a long with other dogs but it went really well! After a day of playing with dogs, he was even calmer on walks and less jumpy when he met new dogs. The day he spent at doggy daycare we went out, but came home before picking Smiley up. Our home felt so empty without him even though he had only been there for ten days! That’s when we decided that we’d be keeping him. But we wanted to wait in case there were any issues with our landlord, although those were unlikely. On Wednesday we took him to the vet again, and even though the rescue knew we were 99% likely to adopt him, Pound Hounds Res-Q paid his bill. Later that evening, we officially paid his adoption fee and he became a part of our family. The next day, I let him play off leash with a bunch of friendly dogs at the park and he did so well, people didn’t believe me that he was a new rescue. Since getting Smiley there has been more stress in my life – we need to figure out where he will be while we’re on holiday. We need to worry about him getting sick, hurting himself or feeling lonely when he’s alone at home. I also have a companion at home now, a smiling face that makes me happier and I can’t walk him down the street without him getting compliments left and right. Oh, he also gets me out of the house more and breathing that fresh New York air! I’ve even met a few local dog owners that are quickly becoming friends. Of course I’m already worrying about Smiley dying one day, but that’s just how my brain works. He has already made my life so much better and more worthwhile. As much as I think that everyone should adopt a dog, or five, immediately, I understand that not everyone is int he position to do so. Foster! If you can’t adopt. Donate to rescues, if you want to help but can’t foster. Dogs, and animals in general, bring so much happiness and unconditional love to our hectic lives. They deserve our help and love, they should all feel safe and happy – the same way they make us feel. Please consider donating to Pound Hounds Res-Q today, without them we wouldn’t have this beautiful dog as a part of our family! We’ve been to Tonsai twice now – once in December and the second time in July. December was hot, dry, lively and exciting! In July it was dead, everything was closed, the weather was miserable! Tonsai is a great place that’s still pretty empty compared to Phi Phi Island and even neighboring beaches. While it’s the perfect getaway during high (and dry) season, it’s really not enjoyable during the low (monsoon) season. Unless you enjoy being one of 10 tourists on a hard to get to spot with only two available restaurants that mainly serve fried food. If you come any other time, you can enjoy a long tail boat ride to the beach, a choice of many restaurants, food vendors and bars, there are lots of people hanging out on the beach or at the hostels but there are also thieving mischievous monkeys! We’re Fostering a Dog Saved from the Kill Shelter! Smiley was pulled from the NYACC by Pound Hounds Res-Q. We are considering adopting him ourselves because he’s such a good boy. The Dodo wrote about him a week ago with the hopes that his story will inspire others to adopt, foster and rescue dogs in need! Author olenakaguiPosted on October 23, 2018 October 22, 2018 Categories Animals and Pets, New YorkTags dog saved, foster, fostering, kill shelter, Pound Hounds, Pound Hounds Resq, rescue, rescue dog, SmileyLeave a comment on We’re Fostering a Dog Saved from the Kill Shelter! The second time we visited Thailand was the middle of July, which is right when monsoon season is wreaking havoc on the island and keeping all those selfie-taking tourists away – but clearly not all of them. The first time we visited Thailand was during the dry winter months when it’s hot, overpopulated with tourists and low tied can ruin boat rides, kayaking and other water adventures. The second time we came in the middle of July, which is right when monsoon season is wreaking havoc on the island and keeping all those selfie-taking tourists away – but clearly not all of them. A week before we arrived the famous case of football camp boys who were stuck in a flooded cave and a ferry had sunk, drowning many on board. We didn’t know about this when we booked and it was quite scary to be there. We got lucky and the weather ended up clearing up, but all ferry and boat rides were rough, scary and puke-inducing. Puffballs of all sizes grow in the forest, alongside roads, in the middle of a green grassy lawn, they can really grow anywhere! You can stir fry them, cook them in the oven and my absolute favorite, is pretending they are pancakes! It’s prime mushroom picking season but it’s quickly cooling down. 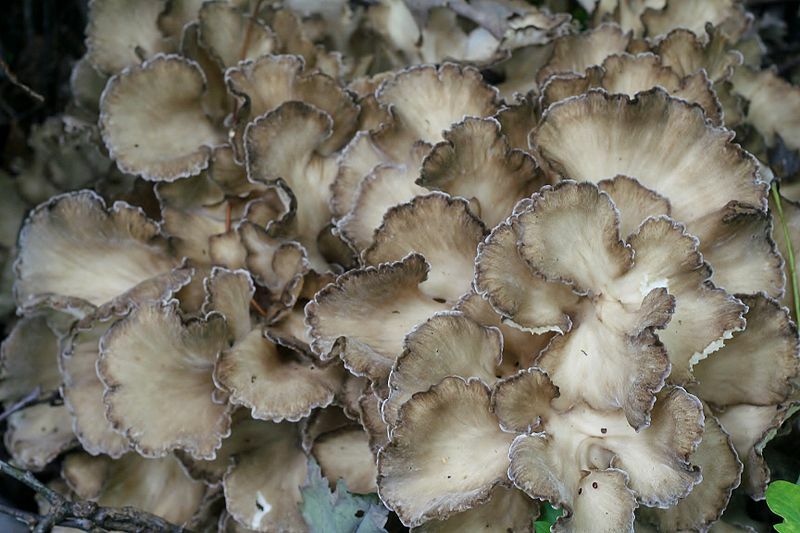 You might be seeing mushrooms all around you, even in city parks and on the side of highways! There’s still some time to go out and forage before winter chases us indoors for Netflix, hot chocolate and hibernation. However, most mushrooms take a lot of experience to identify which can be scary and discouraging. It is also extremely dangerous to eat anything that you’re not certain about. Although there are many YouTube videos and Facebook groups are not always a reliable way to be sure that you will be safe. Even after you read this article, go talk to experienced mushroom pickers, join a mycological society and always be overly careful. It is not legal to pick mushrooms everywhere. Ask a police officer, park ranger or at the info center where you can pick them. If you go anywhere else, you risk getting a hefty fine. In NYC it can be up to $250! Wild mushrooms are not like the ones you buy at the store. Some people might experience an allergy to a specific type even though they are not allergic to others. Some edible mushrooms have skins that certain people might react to with a stomach ache. Although I am lucky to be allergy free and tolerate everything I’ve tried so far, I’m aware that I might eat a perfectly good edible mushroom that might make me feel sick. Let’s get down to business, there are mushrooms that are growing everywhere around New York right now and they happen to taste delicious! The giant puffball (tiny ones are good too) is really easy to identify, grows to be huge so it’s satisfying to find and it’s a great way to begin your mushroom picking lifestyle. Puffballs come in round shapes and in various sizes. They don’t have any gills, or stems, they grow right out of the ground. The regular kind is small, round, white/grayish/yellowish with tiny bumps and they get dark and dry when they are ready to release their spores. When they are dry, you can stomp on them and they will puff out dark-colored spores, which is why they are called puffballs. Giant puffballs don’t taste any better than small ones, arguably they taste worse. But one big puffball can feed a family of three for a day. They can grow to be larger than your head! In their prime they are pure white on the outside and inside. If they are any there color, or have any markings, be cautious. Unlike the hen-of-the-woods that I wrote about earlier this week, giant puffballs do have a very poisonous lookalike, but it’s extremely easy to differentiate them! Once you pick a puffball, cut it down the middle from top to bottom, an edible puffball will have firm purely white firm flesh without any markings. It should look like sliced mozzarella! If the mushroom is off-white, it’s an edible kind that’s past it’s prime. Don’t eat it! There are several stages of a puffball going bad. First, the inside will get yellower but will remain firm. Then it’ll get wetter and darker, at this point the outside might be getting yellower too. Finally, it dries up and releases dark gray/black spores. Even when a puffball is yellow, it’s technically not poisonous. The only type of puffball that is poisonous, is one with black lines that look like intricate designs. These will be on the outside and on the inside. These puffballs are very poisonous and should NOT be consumed. Puffballs of all sizes grow in the forest, alongside roads, in the middle of a green grassy lawn, they can really grow anywhere! Just make sure to cut every single mushroom in half, and throw any puffball that isn’t pure white on the inside. The rule of thumb with mushrooms is, if there is any doubts, leave it behind. If you thought that the hen-of-the-woods had many recipes, just wait until you bring home a haul of puffballs. You can stir fry them, cook them in the oven and my absolute favorite, is pretending they are pancakes! All you need to do is cut 3/4 inch slices, fry them in the oven or on the pan with some coconut oil and cinnamon and serve with maple syrup. If you cook them long enough you can barely taste the difference – they are soft on the inside and crispy on the outside. Delicious. Here are some other recipes. Just a quick reminder, some people don’t react well to the skin of puffball mushrooms (or any mushroom skins). Some mushrooms have tough skin that’s supposed to protect the mushroom from being eaten, this skin can be hard to digest and some people are more sensitive than others. It’s very similar to the skin on certain nuts, if you’ve ever pooped out an intact almond, you know what I’m talking about. Personally, I eat the skin but please be aware that you might have a reaction to it! You can always start by eating a small piece with the skin on, wait a few hours and see how you feel. It can be scary to feel sick after eating a wild mushroom and not know why. Do you have any stories to share about puffballs? What’s your record find (size or amount)? What’s your favorite recipe? Share your puffball stories with us in the comments below! I find these mushrooms the most rewarding to pick, because even a small one is enough as a side dish to any meal and the bigger ones can feed an entire family! Every time I’ve looked for hens, I found at least one and usually had 2-4 kilos (4-9 pounds) in just 30 minutes of searching. Of course, you can also find a single mushroom that weighs 13+ kilos (30+ pounds). Let’s get down to business, there are mushrooms that are growing everywhere around New York right now and they happen to taste delicious! The hen-of-the-woods (maitake) doesn’t have any poisonous look alikes, grows to be huge so it’s satisfying to find and it’s a great way to begin your mushroom picking lifestyle. 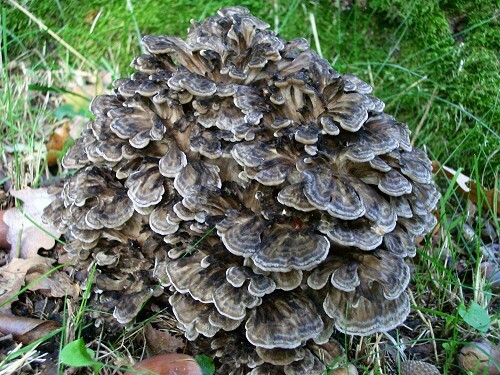 The hen-of-the-woods looks a little like the fluffy feathers of a hen, hence it’s name. Here are some photos of how they can look at different stages of growth. Don’t confuse the hen-of-the-woods with the chicken-of-the-woods. Chickens can grow higher up on the tree, they are orange and they grow in layers. I have heard a lot about these mushrooms and I’m told they’re delicious, however I haven’t found any yet and I don’t know how to tell them apart from the many other orange mushrooms that grow on trees! Stick with hens at the beginning, you can’t go wrong with them and there are plenty to go around! Hen-of-the-woods mushrooms typically grow on oak trees, so if you see acorns on the ground you’re in the right spot. If you look at the roots of an oak, you’ll notice that they have a clumpy shape with many little lumps which is very similar to the hen mushroom. From a distance, you might confuse a hen mushroom with some dried leaves. Always go check it out, and take a look around the entire tree. They tend to grow on bigger, wider oaks and there can be a several clusters of them around a single tree! 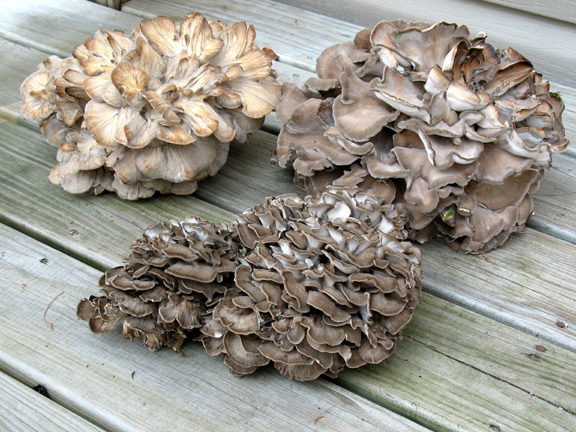 Hen-of-the-woods are either off-white, kind of beige/grayish or more brownish, especially around it’s rounded edges. They always grow in clumps, so from a distance you could confuse them with clustered mushrooms – remember that even though it looks like a cluster, it’s one big mushroom that spreads out and looks fluffy. If you cut it at the stem and you see many individual mushrooms, it’s not a hen. If you see any gills (pictured below) it is NOT a hen. Hens are smooth, fluffy looking, single-stemmed mushrooms. Remember, the picture above is NOT a hen-of-the-woods. It’s an example of gills, that hens do NOT have. Sometimes, the hen-of-the-woods grows on trees other than oaks. If you want to be extra safe, you can stick to only eating the ones that you find on oak trees, although like I already said, there isn’t any dangerous look-a-like. Hens are very unique looking. Don’t forget to bring some common sense with you to the forest. If there are too many bugs on the hen, if it looks dry or off-color, then it’s probably not good for eating. While most insects are pretty safe to eat if cooked correctly, you should stay away from unintentional entomophagy. Plus, insects can cause allergic reactions in people who are also allergic to shellfish. Another common sense move is to avoid picking mushrooms in forests where there’s a mark on the tree, or a colorful rope tied around an area. These could mark a protected area, a sick tree, some sort of pest, pollution, disease, etc. If it looks questionable, don’t go there. Same goes for roadside mushrooms. Think about the pollution that they are exposed to. Would you like some car exhaust with your mushrooms? I don’t think so. Don’t pick anything that looks unclean (not including natural forest dirt) or could be polluted. Similarly to road exhaust, some places could be using pesticides or other chemicals in the area. Although most of us are already exposed to them from the food we buy in supermarkets, the less chemicals we consume, the better. When you find a hen and bring it home, watch a video on how to clean it correctly. It has many layers, the thick white stem isn’t as yummy as the rest of it so you want to cut that off and if possible, clean it outside or in a large tub to avoid clogging your drain with forest debris. If you see any holes, cut into them and remove any insects, spiders or slugs. How do you cook a hen? There are so many ways to cook these mushrooms! Chop them into tiny pieces and stir fry, with other veggies, or if you’re not vegetarian then maybe some meat, lard or eggs to make the perfect mushroomy omelette. The nutritional value of hens varies depending on the website, but everyone agrees that they have very little fat or protein and lots of vitamin D. Some websites claim that they have very few carbs, others claim that they are 70% carbs. Almost everyone agrees that they are a healthy addition to a balanced diet! I tend to use too much olive oil and caramelized onions to make a fatty, crispy, scrumptious meal but there are much healthier alternatives. You can cook them in the oven with coconut oil, you can steam them, boil them, grill them probably even air fry them. Whatever you chose to do, make sure to cook them well as they can be a bit chewy and hard on the stomach if you undercook hens, although this is true for mushrooms in general. You can find various recipes here. If you didn’t manage to find any, or didn’t want to risk picking the wrong mushroom, you can still enjoy eating wild hen-of-the-woods. Check out your local farmers markets from August until November and I guarantee that you’ll find some hens – generally for $1 per pound! Do you enjoy picking mushrooms? Have you tried hen-of-the-woods? Share your stories, tips, recipes and favorite mushroom picking spots in the comments below! Silkworms are popular insects in China because they are native to the region. In school, instead of watching a caterpillar turn into a butterfly, people watch silkworms turn into moths! Soi Cowboy is the crazy street in Thailand known for strip clubs and prostitutes, but there are no ping-pong shows here! We visited the street just to people watch and it was quite a show. We saw women aggressively dragging single men into the clubs and offering all sorts of services. Soi Cowboy is the crazy street in Thailand known for strip clubs and prostitutes, but there are no ping-pong shows here! We visited the street just to people watch and it was quite a show. We saw women aggressively dragging single men into the clubs and offering all sorts of services. They also had a great happy hour deals which I enjoyed and it was an interesting place to visit. Of course, you couldn’t film inside and I only went in quickly to use the bathroom!